I used the chocolate ganache recipe from allrecipes.com (minus the rum – that just leaves heavy cream and chocolate chips), and poured the finished product over a single layer of a chocolate mayonnaise cake that I had made earlier just for this experiment. Anyway, it came out nicely, I think. 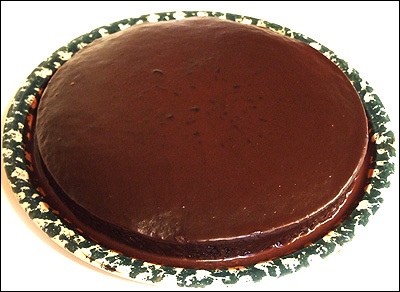 Next time, however, I’m going to add a touch more chocolate than is recommended and wait a tad longer for the ganache to cool, as it was a little thin when I poured it on the cake. Also, if you whip the ganache in a mixer for about 5 minutes I hear you’ll get fantastic frosting, although I haven’t tried this myself yet.